A headstone, erected over a false grave by the Country Roads Board, commemorates those from the barquentine "Chittoor" who were drowned in three separate accidents during salvage operations on the barque "W. B. Godfrey" which was wrecked here on 8 March 1891. Those who died were R. Pleace and J.McIntyre on 18 April 1891, C. Boutler on 18 June 1891 and Captain T. Gortley and Seaman V. Godfrey on 8 October 1891. When the Country Roads Board unearthed a wooden peg with a vague reference to the tragedy in 1930, they decided to erect a more permanent headstone whose plaque was ambiguous. Dobel is not known, Pleace is misspelled and McIntyre is forgotten. Godfrey is also mentioned as having drowned. 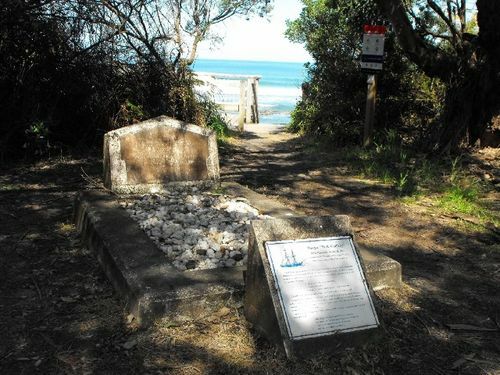 A plaque was placed at the site in 1988 by the Australian Bicentennial Authority and the Royal & Lorne Historical Societies to correct any discrepancies. Some remains of the wreck of the W.B. Godfrey are still visible today scattered on the rocks below the cliff. Sailed from San Fransisco 14-1-1891 commanded by Captain C Davis bound for Melbourne and was wrecked here 8-3-1891 with no loss of life. In three separate boating accidents five men were drowned during salvage operations from the barquentine "Chittoor". Captain Gortley and Seaman Godfrey were buried ashore on high ground. In the 1920s, workmen constructing the Great Ocean Road discovered the grave with a badly weather worn marker. They made no attempt to remove the remains and the roadway was built directly over the grave. This marble headstone was erected over a false grave in 1930. It is a strange coincidence that prior to 1891, a family named Godfrey farmed near this creek. and the Lorne Historical Society.